NGO News blog, NewsLine: In SEVAI Shanthi Matriculation Higher Secondary School, Prof.So.Sathiyaseelan, a noted educationist said, “Teaching is a very noble profession that shapes the character, caliber, and future of an individual”. 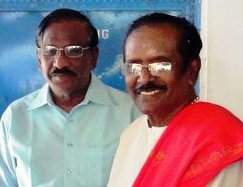 In SEVAI Shanthi Matriculation Higher Secondary School, Prof.So.Sathiyaseelan, a noted educationist said, “Teaching is a very noble profession that shapes the character, caliber, and future of an individual”. Prof.So.Sathiyaseelan, a noted educationist said, “Teaching is a very noble profession that shapes the character, caliber, and future of an individual”.Prof.So.Sathiyaseelan spoke in the teacher’s day celebrated in SEVAI Shanthi Matriculation Higher Secondary School he added, “A great teacher has effective discipline skills and can promote positive behaviors and change in the classroom. A great teacher has good classroom management skills and can ensure good student behavior, effective study and work habits, and an overall sense of respect in the classroom. A great teacher has the ability to develop relationships with their students; the most frequent response is that a great teacher develops relationships with students, Patient, caring, and kind personality Knowledge of learners, Dedication to teaching, Engaging students in learning. Great teachers need to find their own ways to “manage” a group of students. The most effective teachers draw from these well-known theories, but adapt them to their own personality. Great teachers develop and hone their own classroom management style; their techniques vary the common characteristics in their classrooms, few behavior problems, a culture of respect that flows in every direction: teacher to students, students to teacher, students to students, and everyone to guests and a clear, shared understanding of acceptable and appropriate behavior. Greatness in teaching requires consistently outstanding performance over the years. That does not mean that the teacher never has a bad day, or even a bad week. In fact, most great teachers have had a difficult year or two. The best teachers consistently find ways to integrate new methods in an ever-changing profession into their successful practices. Dedication to their work, flexibility, and the willingness to grow are common to great teachers in the face of difficulty and change. Great teachers use a variety of instructional methods that they feel comfortable with; within the same school, you'll find different teachers getting excellent results using such methods as mini-lectures and interactive lectures, problem-based learning, cooperative groups, and multiple intelligences approaches. No single teaching method or approach works best for every teacher with every student. SEVAI Shanthi Matriculation Higher Secondary School -Teachers participated in Teachers day function.